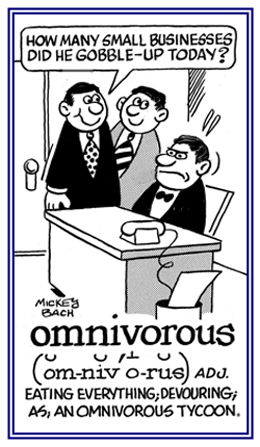 A humorous word meaning, capable of swallowing all words. 1. Excessively devouring or craving all kinds of food in great quantities. 2. Mentally striving to find and learn all existing forms of information beyond what is considered a normal acquisition: "He had an omnivoracious desire for knowledge about everything; both past and present." 1. Having an eagerness to consume great amounts of all kinds of food; ravenous. 2. Having or marked by an insatiable appetite for all activities or pursuits; greedy: "She had an omnivoracity which could not be satisfied." 3. Boundless greed for all things: an omnivoracity for history; a gluttonous consumer of fine foods; a rapacious acquirer of competing businesses; a politician who is ravenous for power. Animals, including humans, which eat all kinds of plants and animals in combination or separately. 1. Pertaining to an animal that consumes a wide variety of foods; such as, insects, leaves, seeds, meat, vegetables, and fruits: Goats are known to be omnivorous animals that eat just about everything, including cardboard boxes! 2. Relating to anyone who has very wide interests and will read, study, or generally absorb or be interested in just about anything that is available: Henry, who is 80 years old, has been an omnivorous reader for most of his life. © ALL rights are reserved. Click on this link to see Chinese omnivorous consumption. Feeding on or devouring birds. Eating rice; the consumption of rice as a source of food. Showing page 11 out of 16 pages of 232 main-word entries or main-word-entry groups.